Sometimes, you need a throwback. Sometimes, you need to stop shooting mutants, and start strategizing. Sometimes, you need to embrace the simple feel of games of yore. Sometimes, you need to play a game like Sneaky Sneaky. This action-adventure outing from Niad Entertainment chucks flashy visuals and heavy content away for a lighthearted tale. You play as Sneak, a bandanna-wearing thief questing to reclaim a sack of rubies that perhaps weren’t technically his to begin with. The Sneaky Sneaky experience is spread out across a sackful of stages, similar to old platforming games. Laid out from a top-down perspective, it’s hard not to think about the original Legend of Zelda for the NES when glancing at this game. 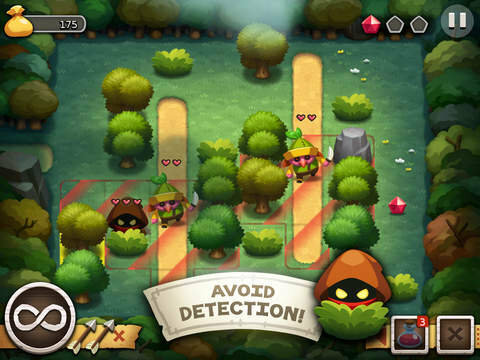 Sneaky is not a rip-off, though, so you can rest easy. The gameplay is compiled of a unique mash-up of light RPG mechanics along with the mechanics of a tile-based real-time-strategy and turn-based battler. Despite the hefty genre twisting it seems to attempt, Sneaky pulls off the complicated coding with grace, and delivers an entrancing experience. Each stage focuses heavily on stealth, providing many options to either out-maneuver or simply hide against enemies. Mechanics are laid out plainly for players; enemies’ areas of awareness are displayed as red squares overlaid on the tiles of the world. If you stumble into their line of sight, you are “caught” and the game makes its switch from real-time movement to turn-based combat seamlessly. Combat naturally favors the enemies by allowing them to move first, further encouraging players to hang to the shadows and avoid conflict. 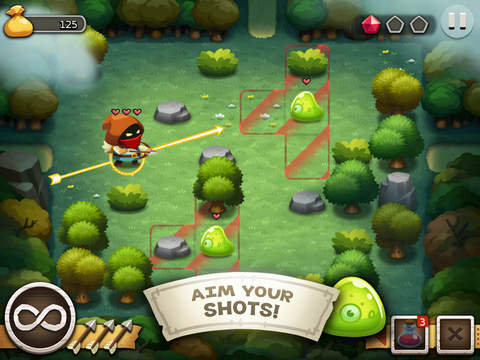 This same framework is repeated for the game’s duration, sprinkling in new enemy types and items as is required for the genre. Repetition is kind to the game, and I did not find myself getting bored by the simple-yet-deep gameplay. Though it only consists of a single-player experience, it manages to feel packed with content and entertain through to the end. I’m happy to report that my biggest complaint is that the game only clocks in at around two hours. This is way too little time for me to enjoy this App Store gem. The quality gameplay is incentive enough to go back and collect all the “rubies” in each level, but I can’t help wishing there was more content nonetheless. Perhaps a sequel is in order! 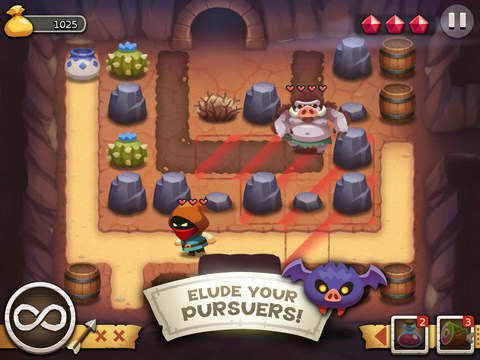 Sneaky Sneaky sheds the desire to tempt with graphics or pack itself with in-app-purchases and instead opts to offer a simple, but fun, action adventure-RPG hybrid. The game gleams with a sense of purpose. It knows what it wants to deliver to players, and it does so with subtle aplomb. Perfectly set up for both long-term sessions, and short play breaks, there’s not a gamer that I think would not benefit from spending some time with this excellent app.